Original article can be found here. The 1968 Indian Skull & Fixed Collection is a reinterpretation of the brand’s first collection launched in 2013. 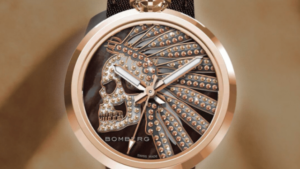 Bomberg is a relatively new player in the world of the luxury watches. Rick De La Croix’s brand was created in 2012 and has always promoted an adventurous and masculine spirit, which has proved problematic in more than one occasion. Its “Domina la bestia” (dominate the beast) campaign in 2015 received criticism from our nation’s feminist sector for a male chauvinist advertisement in which a woman’s figure was depicted as an object. However, those times are long over. In 2018, Rick de la Croix’s brand plans to reinvent itself. At the beginning of the year, he launched a collaboration with Harley Davidson, and is now launching the 1968 Indian Skull & Fixed Collection to the market. This is a reinterpretation of the 1968 Collection, which was the very first collection launched by Mr. De la Croix in 2013. Rick De la Croix is also launching the Time Collection, which is focused on the female market. In previous years, this brand, although principally for men, caught the attention of women as well, who also purchased their products. Now, Rick De la Croix brings to the market his first collection dedicated exclusively for women. Three models comprise this collection. First is the 1968 Chrono, a watch whose bevel is embedded with Swarovski stones and whose dial is made out of mother of pearl. It is available in three colors: brown, blue and purple. Second is the 1968 Ladies Himalaya, a watch to be admired and available in 4 colors; black, pink, blue and slate gray. In addition to the changeable leather strap, its bevel is embedded with Swarovski stones. Lastly we have the Indian Skull, described by Mr. Rick De La Croix as bold and modern, but at the same time courageous. The Indian Skull is also embedded with Swarovski stones, and is available in three colors: two shades of brown and one in blue jeans fabric. In addition, the Fixed Collection is the brand’s first to not have the ability to become a table or pocket watch. There are also two models in this collection dedicated to men. The main innovation brought by this collection is the ability to change the strap of the watch in less than 30 seconds, thanks to a system similar to that of seat belts. This allows the Bomberg user to have a new watch with just the switch of a strap. It is important to note that Mexico is the brand’s most important market, with more than 3,000 watches sold last year.